High school students helped perform the ultimate mitzvah. Rabbi Berry Farkash sighs on the other side of the phone line. I’ve just asked him how often he gets a call requesting that he arrange a burial for a Jew with no family. “It’s unfortunate, but it does happen,” he tells me. Farkash, who runs Chabad of the Central Cascades, in Issaquah, recently received such a call. In early January he was contacted by a fellow Chabad rabbi in Upstate New York, who had learned of a man who passed away at Swedish Hospital, not far from the Chabad center. The man had no next of kin and was only identified after the hospital was able to contact his ex-wife of 40 years. She called her local Chabad in New York, because her late ex-husband was Jewish. Farkash later learned that the man had been struck by lightning while living in New York years ago, which had left him physically and mentally debilitated. After moving to Washington, he stayed at various homeless shelters. In late December, police found him in critical condition and brought him to the hospital, where he died. Jewish law requires burials be done as soon as possible after death, so Farkash needed to act quickly. He arranged for the Seattle Jewish Chapel, based out of Bikur Cholim–Machzikay Hadath, to organize the funeral service. Jewish Family Service, with funds provided by the Federation, made burial arrangements through its Emergency Services program. In the last six months, JFS has handled seven funerals. “We’re seeing an increase in the number of people who are in need of this service,” says JFS CEO Rabbi Will Berkovitz. Still, a situation in which someone passes away with no living relatives is quite rare. This led to another challenge: gathering a minyan. 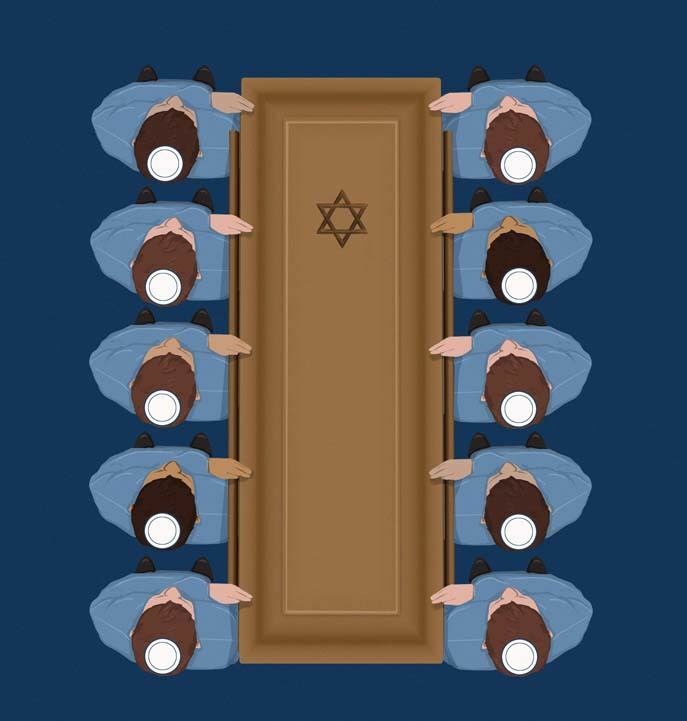 In order to bury an individual according to Jewish law, a quorum of 10 men must be present. Farkash gathered a few people, but he needed more. So he took to Facebook to recruit. Judy Maimon, a parent of a teen at Northwest Yeshiva High School, on Mercer Island, commented on Farkash’s post and tagged head of school Jason Feld. “Can NYHS help out?” she wrote. Feld says that what happened next astounded him. He put out an announcement on Schoology, the high school’s “digital campus,” calling for a few young men to attend the service. Within minutes, Feld had received responses from four students who were ready to complete the minyan, as well as Rabbi Nissan Kornfeld, a Judaic studies teacher at NYHS and the rabbi of Chabad of Mercer Island. I’ve been working with teenagers for a long time, and often there is a cost-benefit analysis involved when they’re faced with anything outside of their normal routines. But there was none of that here. The students intuitively recognized how important this was. In Jewish law, a body with no one to bury it is considered a “met mitzvah.” The Talmud discusses that burying such an individual takes precedence over other commandments. Kornfeld suggests that this hierarchy is what enabled the school to fully support this experience. On January 10, in the middle of the school day, Kornfeld met tenth and eleventh-grade students Dovi Goldberg, Sam Holland, Carlos Kassner, and AJ Maimon at the Bikur Cholim Cemetery off Aurora Avenue in North Seattle. There was no time to officially prepare the students for what they were about to do, but Kornfeld felt confident that they were ready. “Everything we teach subtly prepares them for something like this,” he says. Farkash read a eulogy sent by the man’s ex-wife and shared some of his own comments. The students and other attendees then each shoveled a layer of dirt into the plot as is customary at Jewish funerals.